A food distributors inventory needs can be complex as multiple factors per item must be defined and work in harmony with each other. This includes catch weights, breaking of cases, lot control, processing, promotions, rebates and bill backs to name a few. Our 25+ years of working with food distributors and perfecting our software, ensures entrée will meet your expectations while providing you with a flawless experience. 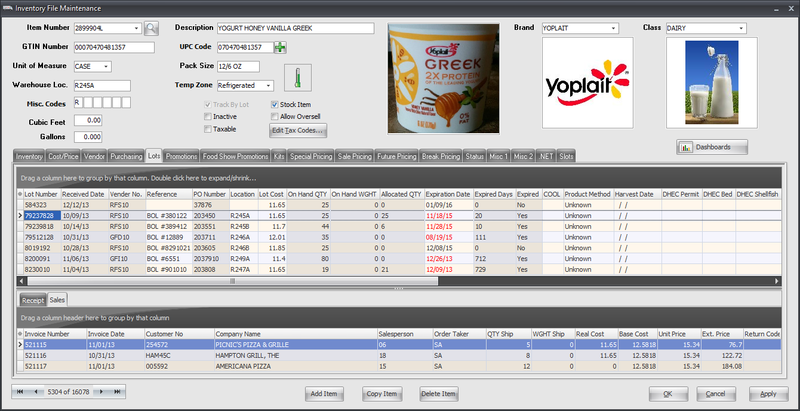 The entrée system includes the most advanced inventory control available for food distributors. Not only does it include all the features you'll need with accuracy and full traceability, but it was designed to be visually appealing to bring your inventory data to life. Many food distributors, especially those dealing with meat, seafood, poultry and cheese, sell their products as "Catch Weights". For example, the item may be packed in a CASE but priced by the pound or kilogram, with each unit having a different weight. It also handles a similar situation dealing with "Constant Weights", where certain items are priced by weight, having a consistent weight per unit, but also needing to be tracked by a different unit of measure. The entrée system handles both the customer billing and inventory control issues pertaining to "Catch Weight" and "Constant Weight" items flawlessly. It will even spot errors if an individual "Catch Weight" is greater than its defined "Maximum Weight" or less than its defined "Minimum Weight". Both inventory control and pricing features are also included for "Breaking Cases", such as a master CASE being sold, tracked and priced properly by individual units such as PC., LB., HALF and QRTR. You will always clearly know how many full cases are available and their on hand value, as well as the inventory quantity and on hand value of any individual units. Customers can purchase any variety of units defined for an item defined with Case Breaking and the entrée system will always accurately update your inventory and provide proper pricing on the customers invoice. 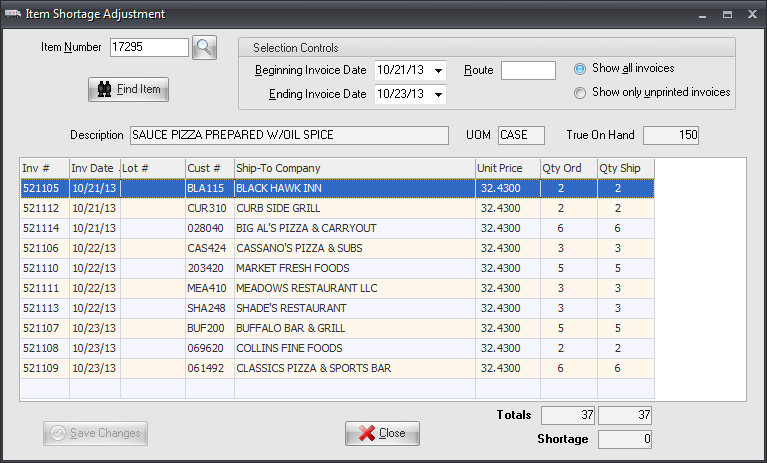 Extensive and detailed control of your inventory can be enabled by using the "Track by Lot" feature in entrée. 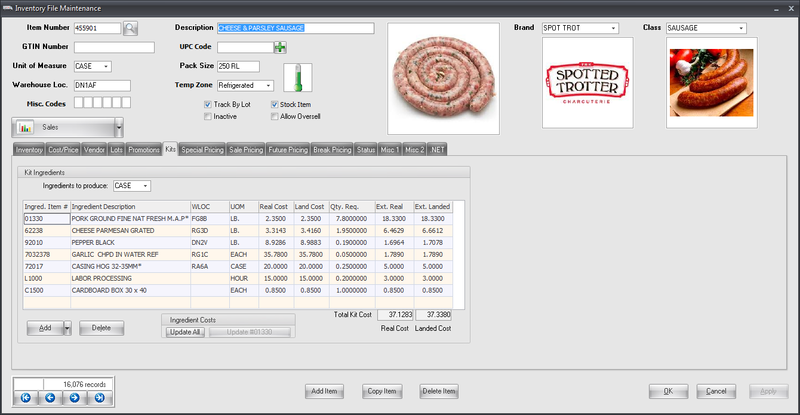 All or selected items can have extended and detailed traceability enabled using lot tracking. This feature provides full support for FDA Bio-Terrorism Tracking requirements and product recalls. 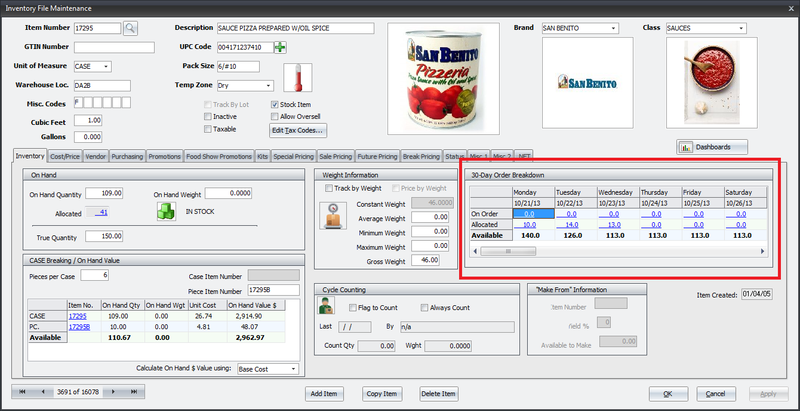 It also provides another method for a food distributor to track exact cost and profitability per item per lot, as well as expiring lots based on expiration and production dates. For food distributors producing and processing their own items, the Kit feature, which acts as a simple bill-of-materials, can be used. Lot numbers can be assigned to each 'batch' of product produced. Inventory Kits allow you to define all the sub-products or ingredients that go into make the final 'master' item. Kits not only maintain inventory quantity and weight information, but also track costs. When the cost of an ingredient is changed, entrée can automatically update the costs and pricing of all kit items which use that ingredient. For simpler needs such as cutting or filleting, entrée can also automatically update inventory based upon a standard "yield %" defined. An important part of any inventory control system, is the ability to project your current and future needs. 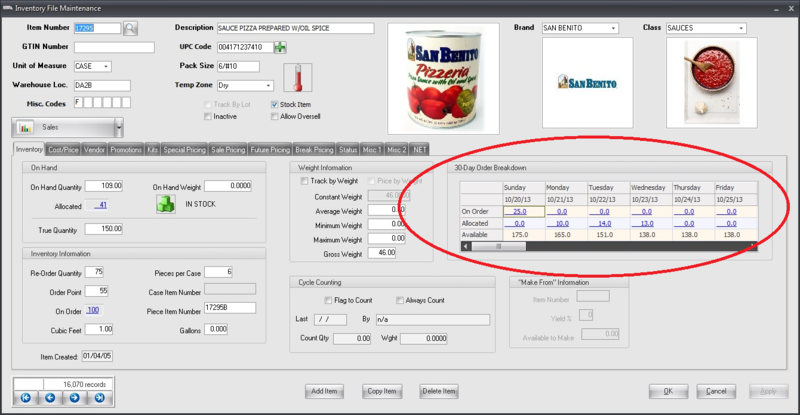 The entrée system provides this feature projecting your inventory needs and availability per day, 30 days into the future. This is especially important for your buyers to track upcoming shortages, too much inventory or other issues which require attention. For each day you will have access to the amount due in from outstanding purchase orders, the amount which has been pre-sold and committed to customers from either sales orders or invoices, and the bottom line, projected inventory available for that day. You can click on any of these projections and have a pop-window provide you with the details as to how the amount displayed was determined. An important part of entrée is its use of dashboards, especially when it comes to analyzing your inventory to summarize large amounts of complex information and represent it in a cross tabulated form, with drill-down options. They are completely user customizable so you can reorganize the layout and sorting using drag-and-drop and you can visualize your data by summarizing into different charting styles including: pie charts, line charts, bar charts and area charts. 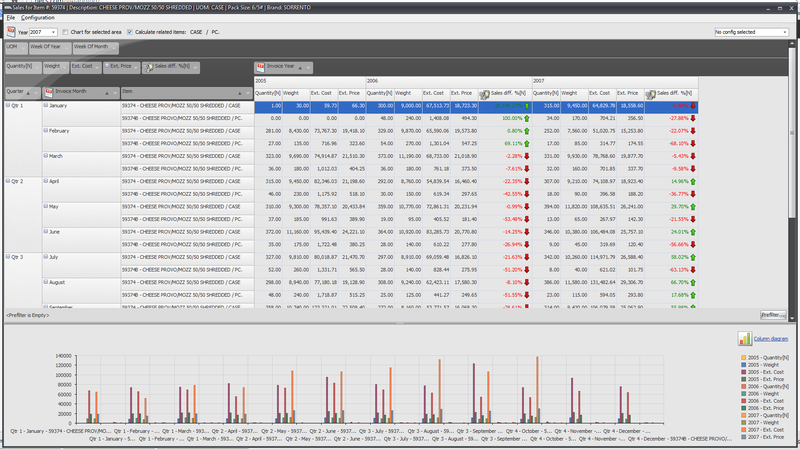 Inventory control dashboards are available for analyzing inventory sales, purchases, returns, short ships, back orders, top selling items and a yearly comparison.. The Item Shortage Adjustments option is provided for those times when you oversell an item and need a tool to easily and quickly adjust quantities shipped without editing individual invoices. This allows you to balance the quantities shipped so that everyone that ordered the item can receive something, rather than some customers not receiving anything. 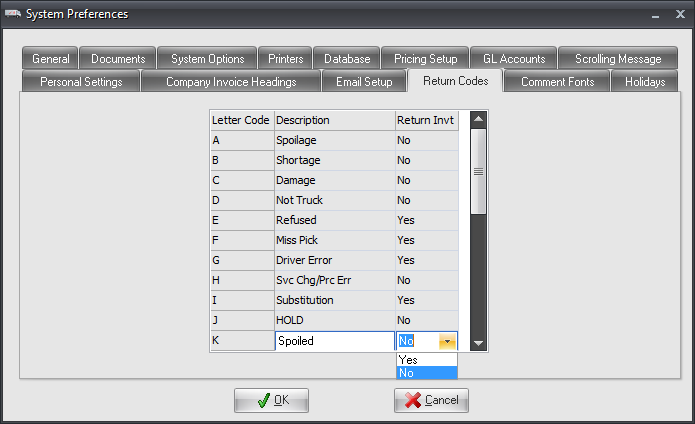 You can view and/or adjust the ship quantity on each customer's invoice within a specified date range and/or route, with the option of including all invoices or unprinted invoices only. When dealing with customer returns, the entrée system will not only keep your accounts receivable organized, but also your inventory. Because there are different reasons for customers returning product, there are different situations in which you may place that product back into your inventory to be sold again. You can define up to 26 of your own "Return Codes" and how the system should handle the inventory when they are returned to the warehouse. A "Return Code" is entered for each item on a Credit Memo and can also be entered directly on an invoice by selecting the Edit Mode of "Credits". You can analyze returns and look for patterns by means of the dashboards provided for Customers and Inventory, as well as the "Credit Register" report. 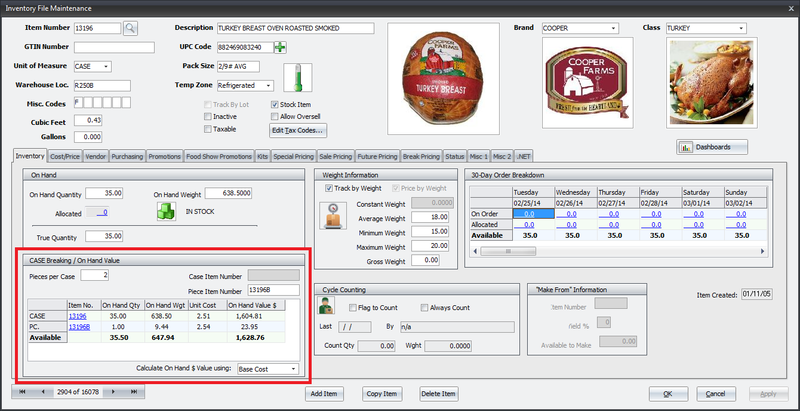 The Cycle Count feature of entrée offers the ability to count a small subset of inventory in contrast with a traditional physical inventory which involves the counting of all items at one time. 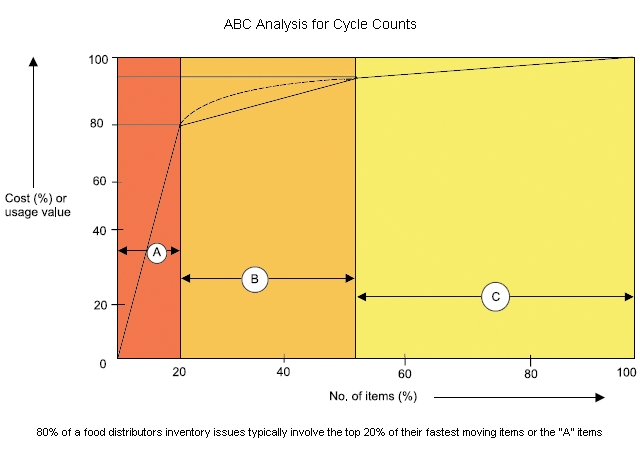 Cycle Counts are less disruptive to daily operations, provide an ongoing measure of inventory accuracy and can be tailored to focus on items with higher value, sales volume or turns. You can specify which items should be counted with any or all of the following parameters: warehouse location range, item number range, specific class or all classes, specific brand or all brands, specific temperature zone or all zones, specific UOM or all UOMs. You can also specify which items should be counted using "ABC Analysis" and specify how many items to return for counting including the Top 10, 25, 50 or all items. Either a paper Cycle Count Sheet can be produced for each warehouse counter, or the task can be automated with our ELECTRONIC WAREHOUSE MANAGER Android application. You can learn more about the Cycle Count feature built into entrée by watching the 16-minute video presented by NECS President, Chris Anatra. 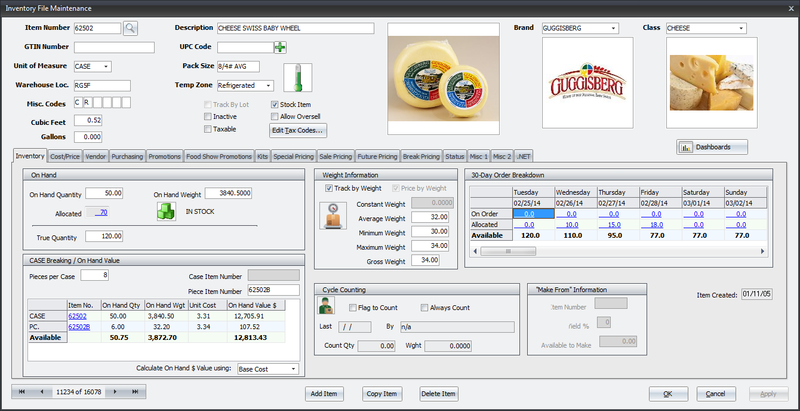 Here the basics of using this powerful inventory control tool are explained.